Solar Art installed vinyl graphics to a dentist office in Rancho Santa Margarita. California! The dentist was looking for a way to upgrade the interior of her entire office. She wanted to create a welcoming and positive environment for both patients and employees, but redesigning a whole office space can get very expensive, very quickly. She was looking for a way have a modern office, while still keeping within budget. She reached out to Solar Art to see what her different window film options were. She knew she wanted something that would personalize her space, so she worked with both our sales representative and in-house graphics team and decided to have vinyl graphics installed to her private office as well as throughout the entire office. They worked together to create a vinyl graphic saying “Hi,” which would make patients feel welcomed and understand the culture of the company. They also decided to have the name of the practice bordering the graphic in lettering. The custom graphics were cut out of 3M Dusted Crystal which creates a modern and clean look. They created more custom graphics made out of the same material that had a striped pattern and installed it to nurse’s stations and patient rooms. It created a modern design factor and also increased privacy in the office. The creative logo design and the other custom graphics are all easily removable with no damage to the glass surface. These particular custom graphics were installed to a commercial business, but they also look great in residential settings as well. In addition to custom graphics, Solar Art also services solar film, decorative window film, anti graffiti film, security window film and exterior building wraps. 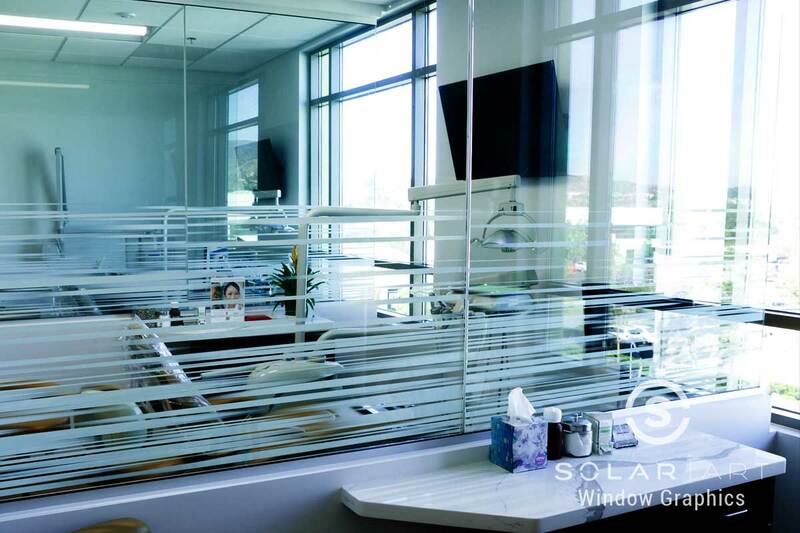 This customer was so pleased with how the installation went, she came back to us and decided to have solar film installed to the windows to decrease the amount of heat and glare that entered the building, increasing comfort for patients and employees both. Contact Solar Art today for a free quote! Contact us directly to talk about Vinyl Graphics! Vinyl graphics are an affordable way to transform any space, whether it is residential or commercial! Custom graphics are easily removable with no damage to the surface!